Per Günther (right) guided ratiopharm ulm to the Beko BBL finals. He’s hoping to get back there this season. 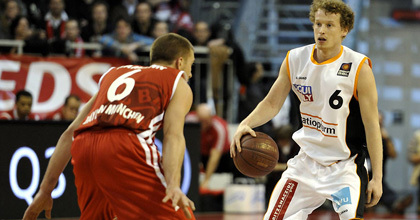 heinnews’s David Hein checked out the weekend’s Bayern Munich-ratiopharm ulm game in the Beko BBL. Afterwards he caught up with Ulm point guard Per Günther to talk about the team’s 80-78 defeat; the club’s struggles in the league and balancing the BBL and Eurocup; trying to not get too far behind in the BBL standings; tipping his hat to Brose Baskets Bamberg. heinnews: Your main weapon, reigning league MVP John Bryant scored just 5 points though he had 10 rebounds and 4 assists. What happened with him out there? Günther: I think they defended him well. Or we have to do a better job of getting him into position. They brought help on pick and rolls, so it wasn’t easy to hit John after that. They gave us something – the shot for the power forward – and usually we have good shooters there. We got some good looks but we just couldn’t make them. I think if everybody had made more shots, it would have been harder for Munich to focus on John. But they stopped him tonight. heinnews: Despite the loss, does this game give you a good feeling, knowing that you really can beat a good team like Bayern even if John struggles? Günther: We knew that before. Obviously John is our best player and an amazing guy and everybody focuses on him. But we still know that we’re 10 guys deep. There are not a lot of teams who play 10 guys. Everybody really gets honest minutes. We got a great spark today from our second unit today – Basti Betz and those guys really came in and played extremely well. And we know that we don’t have to force it. If the game goes one way, we can adjust and make other things happen. Still, in crunch time we’re still going to find a way to give him the ball. heinnews: The team has struggled this season in the league. How much of that is the double burden of playing in the Beko BBL and the Eurocup – where Ulm reached the Last 16? Günther: I think it was a factor for us. If you compare last year with this year, which coach doesn’t want us to do but I think we should do sometimes, we lost some games we weren’t supposed to lose. We lost to the last four teams in the standings. That’s something that has to do with our physical and mental shape. But we have had that experience and know we can win games even with just 90 percent. In the second half we have to take care of our bodies and even though we are playing in Russia on a Wednesday we still have to be ready on Saturday. heinnews: How hard is it balancing Europe and BBL, the latter really being the team’s bread and butter? Günther: It’s tough. This is our bread and butter. It’s way more important that the Eurocup. Obviously this is a nice competition and you can tell your kids that you played against Galatasaray and the other teams. But I still like winning BBL games. The most important games are the ones after the Eurocup road games. A road game in the Eurocup is really tough. Sometimes when you go to Kazan the flight connection is not the best and you’re gonna get home late and everything goes wrong. But we need to keep our mental strength. And you can only get that through going through those experiences. I think right now we have the tendency to think that our legs should be tired and then they are tired. You just have to play through it. heinnews: Ulm dropped to 11-6 and are fifth in the standings right now – meaning you would not have home court advantage in the first round of the playoffs. How important would it be to get home court advantage for the post-season? Günther: It’s very important for us. We saw last year we swept the playoffs where we had home court advantage (Braunschweig and Würzburg) and got swept the one we didn’t have home court advantage (Bamberg). It’s huge for us. But it’s not easy. We are still just trying to go game by game. We have a crazy schedule right now. But once Eurocup is over, we’re really going to lock in and secure home court advantage at least in the beginning of the playoffs. heinnews: How much are you and the team looking at the standings? Günther: I’d be lying if I told you I don’t look at the standings. I do. It’s interesting for me what the other teams are doing. But all the other teams, except maybe Bamberg, are having the same troubles. Berlin are losing games they shouldn’t and Oldenburg are sometimes sloppy and Artland as well. We try to avoid it but it’s something that’s just natural in sports. But I think we’ll do a better job of it in the second half of the season. heinnews: What do you think about Bamberg’s showing this season after losing six of their top eight players from last season and then missing their to-be starting center for the first two months of the season and still cruising? Günther: I guess you just have to tip your hat to coach Chris Fleming and his scouting team. Every year you hope that finally this team is going to get picked apart, but it’s not going to happen. I guess what the BBL has to realize is that we can’t wait until Bamberg gets worse, everybody else has to get better.